Tanya W Macias recorded a word that was given to her in her prayer time that was very loud and clear about a coming war in America. She says in the video that she quit her full time job just to pray full time for her family’s safety in the days ahead. There are several posts where I have been collecting visions and dreams of a coming invasion to the United States. All the dreams have several themes within them. One of the themes has to do with Russia, and the other has to do with china. Some of the dreams are combined with a coming tsunami wave. Here is another map detailed by Chuck Youngbrandt which was found on his facebook page. 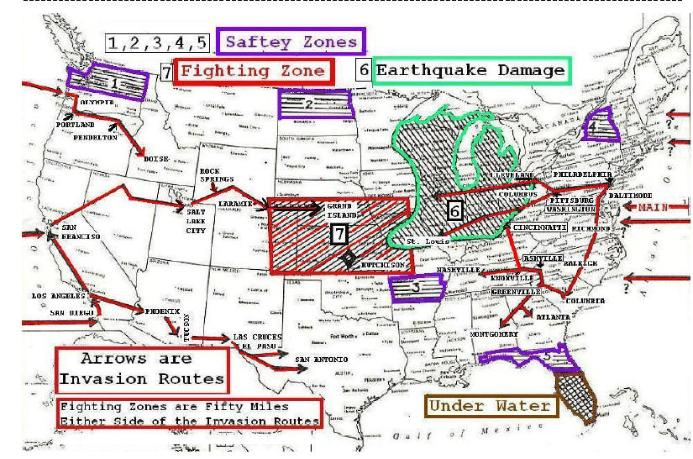 What he sees lines up with the safe zones which many say are in Washington, Idaho and the Ozark Mountains. I am not sure about Northern Florida. I haven’t heard yet about a safe zone there. The invasion mentions are always through Washington state, and California. It is interesting to see the routes here on this map. Maps have copyright notice, and permission to use as you will, just leaving the copyright notice. I do not want people selling my version of the hand map on the internet, but I do want them to be able to find me. Paul. Red lines are to indicate interstate routes. Actual routes are near the lines I have added. Areas about fifty miles each side of the interstate will be in a bad way from invaders. Again, don’t set your life choices by these words, or papers, or pictures. You need to know from the Lord. If these are never needed, you have my permission to laugh. Wesley Kennedy This isn’t about California or tsunami but I dreamed of an invasion. In my dream I looked into the heavens. I saw Kim Jun Un’s face (dictator of North Korea) , like a huge picture of him, coming toward earth. I saw the word Russia under his name. Idk really what it meant but I think, that North Korea is being backed by Russia against the United States. Lindsey Marceau In 2013 I had a dream of Asian (Chinese) military invasion. I remembered they were Asian and had a red arm band around their uniformed arms. Theresa Bulmer that’s what I saw as well last year, they were Asian military and they meant business! Tiffany Powell Boal I had a similar dream several years ago. There was an invasion by an asian army (I could only see uniforms and soldiers but didn’t know who at the time) and they were walking down streets with explosions in the big city behind them and into the church we attended at the time. I saw members of the church hiding under the floors and the army was walking above them on the floor looking for people and trying to figure out where they all were. Many of the parents were screaming and running to the nurseries for their kids, and several families who had all come together were gathered to a separate area being held. There were other details but after the dream when I woke up I looked up the uniform I saw and it was Korean. 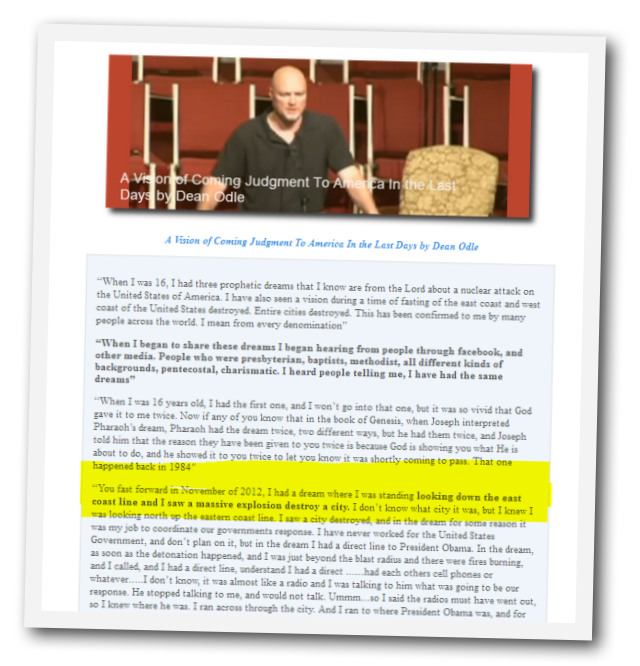 I fully believe N. Korea is part of a massive attack on the US, on our soil, and on Believers. Rhoda Helene Weber 4 years ago I dreamt of a huge tsunami hitting the west coast, similar to yours. I was taken to a higher place and placed in a glass house where I watched the water raise and NO ONE was alarmed. Then about 3 years ago I saw ships on the ocean all coming to the West coast. On the ships aliens… not a single American concerned about this I called the alert and no one listened.. I knew if they were allowed to land it was because judgement had come.… I have had tsunami dreams over the past 10 years along with others. Anita Merritt Greening I have had dreams of missiles hitting major US cities. The cities were completely blown away. Also, a dream of Russian MIGs flying over the continental US. That dream of the MIGs took place about 4 years ago. I had no idea what a MIG was, and had to look it up after I woke up. In another dream, I saw a giant book. It was unlike any I have ever seen. It was very old but in good condition. Soldiers were looking at it. I looked over their shoulders at the book. The title was Critical Events of the World. I have never seen such a huge book. They opened it, and I saw a couple of dates. I don’t remember the events that went with the dates or the year of the events. One of the dates was March 11th. I pray over the dates every year. Bonita Roper In 2004 I had a dream where hundreds of people were hid in the basement of a church , we were helping people who were wounded. The small windows in the basement were boarded over and it seemed we were in hiding. I could here the sound of military men marching outside the window. And new in the Spirit that there had been a disaster or we had been attacked by an enemy. But when we would run out of supplies there would be a truck appear and supply us with what we needed without anyone being able to see. Our family in the Midwest is preparing for anything. Joshua Shallenberger (May 29, 2016) I had a dream last night that someone detonated a small nuke downtown Chicago. I remember vividly seeing the small mushroom cloud from a distance. Warning Vision: Convoy Of FEMA Vehicles Rushing In – East Coast Be Prepared! I had a warning vision last night that was very clear. It was exactly like this photo. A Convoy of white FEMA vehicles rushing into an area on the East Coast that had been hit be destruction and lost power. I am sharing this warning so others can pray PSALM 91 and be prepared. It will happen. Cecilia Carter I haven’t had that dream. I did have a vision January though. It was dark, stars were out,a symbol came before my eyes( it was North Korea ), red not yellow like its symbol. Following behind the symbol was a white, slightly glowing asteroid. Linda Melton Shields Perry my dream was not of a tsunami, but I dreamed we were being bombed. People were trying to run and hide and was hiding under the underpass of bridges. They bombed the bridge beside us and I knew we were next. I remember thinking I know I am going to die but I said I may die but I am going out praising the Lord. Jane Jones I hope and pray that you read this and take it seriously. I am a just a housewife and do not claim to be anything at all…but I had a very brief vision of a missile coming up from out of the water. This happened this morning. I dont know if this is connected to what you have seen, but as soon as I read this, I felt the strong need to share this with you. John Starcher I had a dream of looking down on a sea of people screaming up to a huge ship that looked like an air craft carrier. Debbie Weissman Years ago I had a dream of a beast rising out of the sea and marching towards land just like in the movie Godzilla, except it wasn’t Godzilla. It was an Asian woman dressed in a red and white kimono. The waves were high around her but was stayed until she hit land. She Was massive, hundreds of feet tall, and was wearing wooden sandals. I hid and watched her devour people. I realized the blood was the red on her kimono. I was safe, because Jesus shielded me from her but she was frigjtening. Then the waves came and destroyed all the buildings. Debra Stone I had a dream a few days ago that I was in a town at an event with strangers and family , and as I was walking towards the Family all these military helicopters were landing on our ground it was a invasion some that were green and some white. The green ones I looked right at the pilot and he looked to be from China and the white ones no one could tell what country,but as all of us that were there gathered were thinking it was Russia. There was more to the dream but that was the part that bothered me about my dream .I woke up and the first thought was about it is we were invaded by two other countries. Kelly Sutton Woodard I just told my pastor last week about a dream and visions of humongous waves like tsunami or tidal wave. And a mushroom cloud from a bomb. Kirk Adams I’ve never had a West Coast tsunami dream, but in 2002 i saw a wave of water higher than the Statue of Liberty heading towards it & Manhattan. I was in worship at my mom’s house when i began to see the Statue of Liberty with fire around the base of her feet (liberty under fire) followed by a black President addressing people on the steps of the Capital building in ruins. Then a flaming meteor streaked across the sky, then the tsunami wave. After that was a man with milky-white, almost transparent skin (holiness), brown hair, glasses(focused vision), goatee, dark green sweater(true prosperity) and brown pants standing with his left hand on a fence. There was a directional arrow in the sky (with the letter E) pointing towards the horizon with light green colored grass. The horizon itself was blackened with gloomy clouds in the sky. There was smoke rising from two locations in the northern part of the scene. The Lord spoke (trident missile failure), then every thing was pitch black. I saw the muslim moon&star with an iron cross coming over the top of it. Then a bright, white light in the shape of a half moon. In the center stood a pitch black person with red eyes (anti-messiah). Melissa S. Van DuserBack in early Jan of 2009 I had a dream I seen a missile launched (out our own nation) it flew from the north part of the US from N and S Dakota, Minnesota, Wisconsin, Iowa area. (I live in Missouri) It didn’t show what state it came from just that it came from that direction and it was heading to the south east area towards Florida around in there. And then the south east sent a missile back to the north and I was walking in town when I seen this happening. The dream was in a amber sand like color at first. As I was walking home there where a lot of people standing watching this and out of the north were the missile went a huge sand storm was coming in fast and I was walking fast to get home. The sand storm was right at my heels when I got in and closed the door. As I was in the home it was like nothing was going on outside. It was quite and peaceful. I went to my room and the room was were I grew up in when I was a young girl and it was getting dark out. I didn’t turn on my light but I started to pack like I was getting ready to leave to a place where it would be very cold like Alaska up north. I packed a lot of quilts, afghans and a pair of boots. I was also trying to figure out what to bring and what not to bring and they were none important stuff. I then looked out a small window where it was night out and then I seen trees that were cut and the stumps were the only thing left and the stumps and the grass was burnt and there were small patches of fire still burning and I said in a sigh tone “Obama!” Then I woke up. Not sure what that all meant but it was interesting. Kim Fox-Cross I had a vision that I shared with my sister…I was lifted in the dream up into the sky…when I looked down I saw a map layed out flat I saw a great crack appear to the west and a great wall of water coming towards a massive city…the map also had fire erupting from a volcano and the people were like ants running everywhere...the only thing left visible through the smoke was the tops of the mountains…but few people made it there. It seemed the ones who did were already there waiting before these events occured because they had large backpacks on their backs and suitcases with them. I also saw a terrible event take place on the east coast there were fires breaking out every where in several cities ..thousands of ppl were burning money and filling the streets...i saw massive planes dropping soldiers from the sky and another large one carrying the president and very rich and powerful people but they were leaving the U.S. I was then on the ground in a grocery store that was empty. I tried to call my family to tell them but woke up when someone answered. This is just one of a few dreams that I have had about tsunami’s..
Jamie Tucker Most of my dreams involved nuclear weapons striking major cities in the US. I’ve also had dreams of hurricanes hitting the East Coast from Florida all the way up to Maine. Debra Walker Pratt Two nights ago, I dreamt of a large black cloud approaching at a high rate of speed, as if it was a pyroclastic plume from a volcano. It was enormous and so fast that there was no escape! I had only enough time to tie a cloth around my nose and mouth, warn others to do likewise, and proclaim “Jesus Christ is Lord.” This is the second dream of a dark, inescapable cloud coming. I had the impression that the first dream was in the Dallas area. Israel Wendy I was standing outside some kind of installation. I could see razor wire. I could see very high fences meant to keep people in and very dangerous spikes so that you couldn’t touch the fence and as I was focusing on the fence the distance was blurry. But I could see tents and I could see people walking about. It came to my mind that this was the FEMA camp. All of a sudden I saw a nuclear bomb a small local one dropped on the camp then two others followed. Then I was flying above the camp and I saw the wave of radiation just incinerate every man woman and child. I was from a distance but I was horrified. 3 nuclear bombs dropped on purpose on innocent people. Tony C. Cabrera I too saw visions in 2004 of gigantic tsunamis, famine after nuclear aftermath and lots of aircraft warfare for 3 consecutive nights. Jean-Jacques Emily Molenaer In the dream I was in my bedroom asleep just as I really was. I awoke ( in the dream) to a newscast on TV. In reality, we don’t have a TV in our bedroom,so I was puzzled about the TV in the BR. While my head was still on the pillow, I looked over at the window and sensed an eerie calm outside. The window shade was pulled down and I could see from a gap in the side, where the window met the shade, that it was snowing outside. Now, I was really puzzled, because it was (in reality) August 7. Then I turned my attention to the TV on my dresser……the TV screen was not facing me, as the TV was turned to the side, but I could see the news anchor at his desk. As he was reporting what was happening somewhere in the US, there was live film behind him of what was occurring. I saw people running for their lives, through the streets, screaming in a panic, like they were desperately trying to get away from something. Something was raining down on them and some people were naked. As I listened to his reporting, I knew this was affecting me and my family. 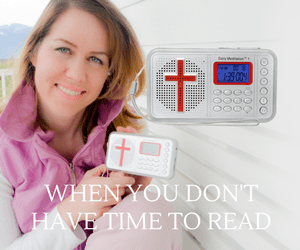 I’ve never felt fear like that before nor since…..it was as though something had gripped me in my chest and I awoke suddenly praying loudly in a foreign tongue. The prayer was almost violent and I couldn’t stop it unless I closed my mouth. The Lord erased from my memory everything the news anchor said. Since this was 25 years ago, I don’t recall if it was then or a couple of days later, while in deep prayer, that the Lord said my whole family was wiped out…..but what I do recall with clarity, is that when he said this, a total peace enveloped me and a smile came over my face because I was relieved…..my spirit understood this, but my mind didn’t. One of my nephews, had a dream while away at college–3 years ago. It disturbed him, so he called his mother, my sister, to relay it to her, and she then called me. In the dream, he was home with his family. Their finished basement is where their family room is located and is a walk-out into their backyard. He and his Dad were in the FR when they heard a big booming sound. They walked out the sliding glass doors into their yard and saw in the distance — south of them, in the direction of NYC — a huge mushroom cloud, what appeared to be a nuclear bomb explosion. They quickly ran back into the house and he awoke from the dream. I was back in the marines. We were on a secure base, but under alert. We knew we had a Muslim enemy close by. It was just a matter of time before they made their move to invade our compound. Two buses came to evacuate a small number of us. The first bus came, and it filled extremely fast. Those people were already, ready to go….there was no hesitation of its filling and departure. I sensed that was the dead in Christ that were taken. The second bus came not long after the first. I was to board that bus. In order to get to it, I had to overcome some strenuous obstacles that I normally wouldn’t have had the strength to complete. The closer toward the end of it, it just kept getting more difficult and more strenuous. The only way I was able to find the strength was to pray the whole way through it….but because of those prayers, I found the strength, and never missed a step.When I came to the end of the obstacle, (a long narrow path with much resistance) I had to kneel down very low and exit the compound through a low, narrow hatchway. There at the end of the obstacle, a marine DI stood. I believe he represented Jesus in this dream…..he told me I had done a good job.I then proceeded to the second bus that was awaiting me. Others were already in the bus and waiting. The bus didn’t have all that many people in it though. Many would be left behind and would have to face the soon to come invasion.I had been carrying a brown leather bag, with all of my most valuable earthly possessions in it , through that obstacle I had just completed. As I was about to board the bus however, I looked and realized it was now somehow gone. For a brief moment I considered whether or not I should ask the driver of the bus to wait on me so that I could return and try to find it. Immediately however, I thought…NO…leave it. I won’t need it anyway. I then turned to board the bus. I was between the rear wheel and the door, and then woke up. That was maybe three months ago now….and I was being shown that I was between the rear bus wheel and the bus door. I feel like we are closer than that now. I feel like, …before the invasion order comes, that second bus will leave with its few passengers. Lissette Torres I was thinking yesterday about this. I dreamed I saw my husband in military gear about 2 months ago. I wondered why I dreamed that because my husband served in the military years ago and is disabled. I think God is telling us to get ready to fight on our knees and live for him! Teresa Douglas About a week or so ago I had a vision of seeing a newscaster on TV and behind him a large bear was about to attack him by surprise! He had no idea!!! Then on another occasion I heard this in the night, “4 BEARS!” I believe that the US has 4 enemys that are working together to bring us down! Russia, Iran, China, and North Korea! Since this I have been seeing bears everywhere! On the internet, TV, and even while being out and about! I believe that all this is a warning about what is about to happen!!! A SURPRISE ATTACK AND WAR! Misty Irvin Gosser I dreamt I was in a classroom and sirens started going off and all these military men started running out onto the soil due to some type of war in America. We were put in lockdown within the building.I dreamt about 3 weeks ago that God told me to look up and there was this huge war in the heavens up above me and then all of a sudden complete darkness covered the earth. I said,” I can’t believe I’m alive to see this complete darkness covering all the Earth. 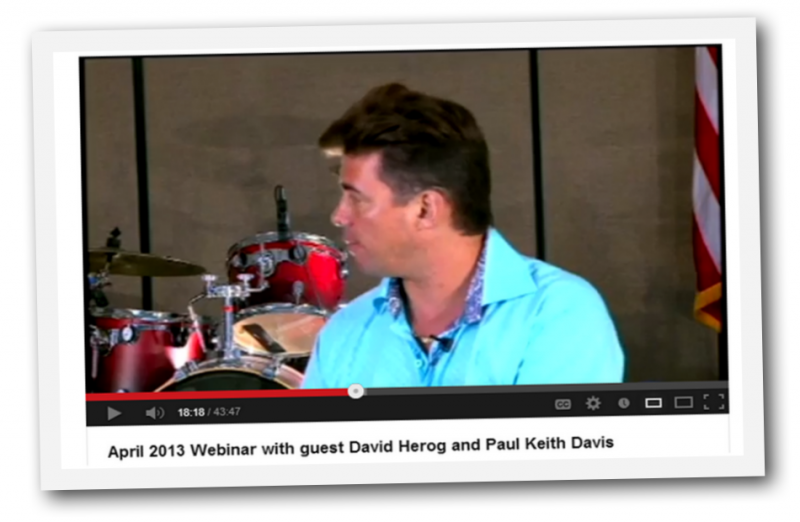 David Herzog was on the Paul Keith Davis show doing a webinar April of 2013 where he David was recounting an experience with a top official in Russia, while he was there on a ministry outreach. Washington D.C. Terrorist Attack – My very first vision took place on 9/11/01. I had just moved from Washington DC area to Fort Lauderdale for a job I was offered. I was staying with my cousin until I could find a decent apartment. Since I had not officially moved to Florida yet, all my furniture was still in my apartment in Arlington, VA.
As I pulled up to the office, someone came running out saying a plane had his the Trade Towers in NY. My first thought was, “It must have been a small commuter plane as the big planes don’t fly near the city.” When I got inside, I realized the scope of the event. As we watched the event on TV, we saw the second plane hit the 2nd tower. Now we realized that we were under attack. Within no time, we watched as a plane flew into the Pentagon. This rocked me, because I had been in there several times due to my position as a contractor for the government. It was also pretty scary because the Pentagon was only 1 mile from my house in Arlington, VA.
My first thought was, how deep will this attack go? I walked back to my desk to call my brother to discuss the events that were unfolding and as soon as I sat down to call, I suddenly found myself floating above the City of Washington D.C. Imagine my shock as I am hovering above the city when only moments ago I was sitting at a desk. As I hovered there, it was like my eyes zoomed in to man standing in front of the White House. He was a dark skinned Middle Eastern looking young man around 18-24 years old. He was wearing a gray hoodie with a black and white striped shirt underneath. He had a large black backpack on his back. He took off the backpack, then he pulled out something that looked like a wire cord and then I saw a blinding flash. I am assuming that it was a dirty bomb. I zoomed back to where I was floating in the sky and I saw a small mushroom cloud in the center of DC. I could see all my friends who worked in DC and they were killed. Instantly, I was sitting back at my desk holding my phone in my hand that I was about to call my brother on. I immediately teared up and felt like I was going to throw up. I grabbed my trash can and held my head over it for a few minutes until I felt better. This was the first time I had ever experienced something like this. Besides being given a vision, I had seen friends of mine dying right in front of me. I was so sick and scared. When I regained my composure, I called my brother and my friends that I had seen in the vision and told them what happened. They were all in route to go home anyway, and they dismissed my story as my imagination. I ended up getting saved about 5 months later. A vision about an explosion in the Gulf of Mexico was also given to Brittany (last name unavailable) on July 30, 2010.